For more than 35 years, people all over the world have connected to sound through a Baha® bone conduction implant. The Baha System uses the body’s natural ability to conduct sound through bone conduction, and has the potential to make an immediate and positive impact on how well you hear and communicate. While a lot of the sound we hear travels to our ears through the air (air conduction), we actually hear a great deal through vibrations in the bone (bone conduction). When a person with normal hearing hears their own voice, most of what they actually hear comes through bone conduction. Problems in your outer or middle ear can block or restrict the flow of sound waves, preventing them from getting through effectively to your inner ear. A hearing aid relies on forcing enough sound through these problem areas, whereas bone conduction implants uses the body’s natural ability to transfer sound. By exploiting the full potential of this natural process – you can hear better and clearer than ever before. While a hearing aid tries to push sound through the damaged area, a Baha System uses the beauty of bone conduction to send clear, crisp sound directly to your inner ear. Today there are two types of Baha systems. Both offer unique Cochlear technology designed to help you hear and communicate with confidence. 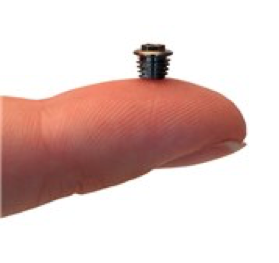 The sound processor turns the sound into vibrations and sends them through the abutment or magnetic connection to the small implant. The implant transmits the vibrations through the bone directly to your inner ear. Bone anchored hearing systems are designed to use your body’s natural ability to transfer sound through bone conduction. The sound processor converts sounds into vibrations which are then sent through your skull bone, directly to your inner ear. The sound processor clicks easily onto the abutment. 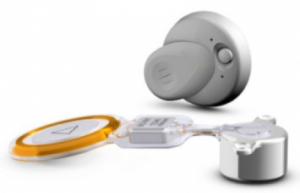 Once attached, it picks up sound waves in much the same way as a conventional hearing aid. However, instead of sending these sound waves through the ear canal, it transforms them into sound vibrations, ready to send through your skull bone. Thanks to the direct connection between the sound processor and the bone through the implant and abutment, your skin does not dampen the sound vibrations, which gives a clearer sound. When you click off the sound processor, for example when showering or sleeping, no sound vibrations are sent and your hearing will return to its original state. The Ponto System is an example of Direct Sound Transmission. This provides the best amplification and output, as compared to skin drive systems, where the skin creates a dampening layer between the sound processor and the bone. Getting a bone anchored hearing system is a well-proven, safe and relatively simple process, often done under local anesthetic. With the new Minimally Invasive Ponto Surgery, a small incision is made corresponding exactly to the size of the implant and the abutment. This removes the need for suturing, which means even less time in surgery. The MIPS procedure also reduces scarring and shortens healing time. Furthermore, if you decide bone anchored hearing is not right for you, the procedure is reversible. Who can benefit from a bone anchored hearing system? If your hearing loss is due to problems in your outer or middle ear, talk to your hearing care professional about bone anchored devices. Specifically designed to bypass any problems in the ear canal or middle ear, these devices can offer you far clearer, more comfortable hearing. The Med-El BoneBridge is another type of bone-anchored auditory processor system that may be used in patients with microtia and atresia. The BoneBridge is the world’s first active bone conduction implant. This bone conduction implant enables sound transmission directly to the inner ear by means of bone conduction. 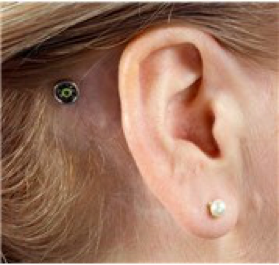 The BoneBridge is a semi-implantable hearing system, in which the implant is positioned completely under the skin. 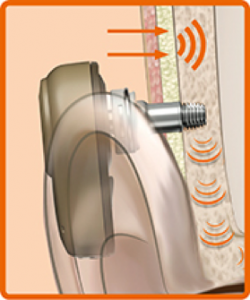 The implant receives the signals from an external audio processor which is worn under the hair. The Vibrant Soundbridge is a middle ear implant system that is another alternative for patients with microtia and atresia. The Soundbridge is an alternative to conventional hearing aids or bone conduction devices. This device consists of an externally worn audio processor and an implant which is surgically placed under the skin. The audio processor is held in place by magnetic energy and can be worn under or over the hair. Sounds are picked up by the microphone in the audio processor. The audio processor converts these sounds into electrical signals. The electrical signals are transmitted through the skin to the implant. The implant relays the signal down a conductor link to the floating mass transducer. The floating mass transducer converts signals into mechanical vibrations which set the structures of the middle ear into motion. The motion of the middle ear structures then send the vibration directly to the inner ear hearing organ. Auditory Brainstem Implants are suitable for those with a profound sensorineural hearing loss, leading to near total loss of sound. An auditory brainstem implant has two parts: an external part (the ‘processor’, worn on the ear) and the surgically implanted internal part. A microphone on the processor picks up the sound around it, and turns it from a sound wave into an electrical signal. The processor then transmits the sound signal to the internal part of the hearing implant. This consists of a receiver just below the skin, together with the implant array which is positioned within the brainstem. This means that the implant is bypassing both the cochlea and the hearing nerve, taking a short cut to the brainstem. 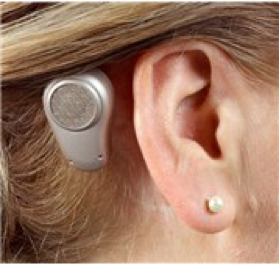 In this way the auditory brainstem implant aims to give a sense of sound when the hearing nerve is not working. One main use of the auditory brainstem implant is for those with the condition Neurofibromatosis type 2 (NF2). If you have NF2, you are likely to have a tumour on or near the hearing nerve. If this tumour is removed for medical reasons, the surgeons may well have to cut across the nerve of hearing. This brings about a complete breakdown of natural hearing in that ear. During the tumour removal surgery, the surgeon may consider placing an auditory brainstem implant as an alternative method of hearing. Other uses of the auditory brainstem implant are for people who are born with no functioning nerve of hearing in either ear, or people who are deaf because of an unusually shaped cochlea. Sometimes meningitis leads to deafness but leaves the cochlea too damaged to take a cochlear implant. However, an auditory brainstem implant for one of these reasons is very rare, because the auditory brainstem implant requires neurosurgery. An auditory brainstem implant may provide a link to sounds when there would otherwise be no natural hearing at all. 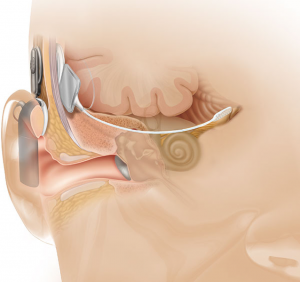 An auditory brainstem implant may help with lip-reading. 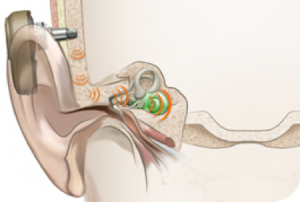 An auditory brainstem implant involves complex neurosurgery to the brainstem. Your consultant would need to discuss all the risks with you. The results of an auditory brainstem implant are extremely variable. It is a difficult task to position the auditory brainstem implant on the brainstem exactly to deliver sound. It is possible that there is no hearing sensation at all from the auditory brainstem implant. In some cases the hearing sensation is within a narrow range so that sounds are not well differentiated. It takes time to adjust to the sound perceived through an auditory brainstem implant.